If you read my post this past spring about my vanilla rhubarb custard bars then you know I have a love affair with rhubarb. My mom used to cook us delicious pies, jams and crisps that would make my tummy sing and my mouth water for more. Rhubarb is typically a northern vegetable and finding it down south is a rare occurrence. So when I tracked it down last April and then again this past July, you better believe I swiped it up faster than my four year old could say “Swiper no swiping!” (bear with me, we have a Dora the Explorer video that gets played way too many times on long road trips). You all know about my first creation (Yummy!) so let’s talk a bit more about the most recent one. I hadn’t planned on posting this recipe up until Friday, but then my good blogger buddy Julie over at Willow Bird Baking posted an awesome post chronicling her several different kitchen flops and once I read it (and it was awesome by the way), I decided that I had to move this post up to today. Because, you see, this pie wasn’t originally intended to be a cream pie. It was supposed to be a rhubarb tart. I had every intention of making it a tart until I dumped the fruit over the top of the cream mixture and it just kind of sunk to the bottom of the pie like an anchor with an extra weight attached for good measure and disappeared into the creamy abyss. But you know what, I worked with it, improvised a bit, and wouldn’t you know it turned out to be a pretty darned good pie, despite the initial doom and gloom. And yes, as Julie stated in her post, I was indeed making this little slice of heaven to take to a couple’s home for our first dinner get together. No pressure what.so.ever. Isn’t that when things always seem to go wrong? So thank you Julie, for reminding all us cooks, that things are going to go wrong when we cook and bake. None of us are perfection in the kitchen. But if we take our mistakes and learn from them, we can become better cooks for it and hopefully come out with something equally as tasty, if not better on the other end. 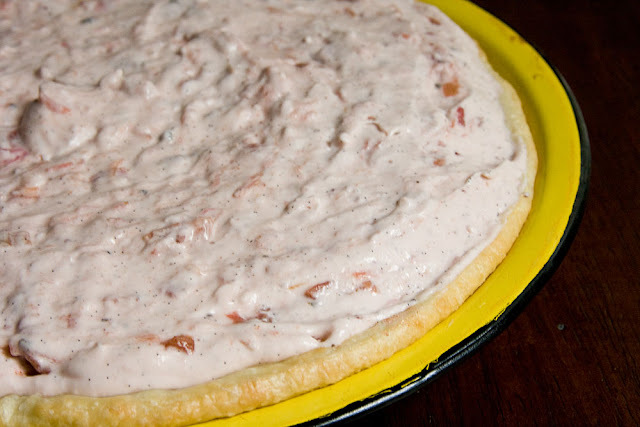 So are we ready to put together one mighty delicious Strawberry Rhubarb Cream Pie? Who’s with me? We’re first going to start out by cooking up our pie crust. Grab yourself a pie dish and lay your crust in, making sure to push out all the air bubbles. Then grab a fork and stab that dough until it’s holier than Pope John Paul II. 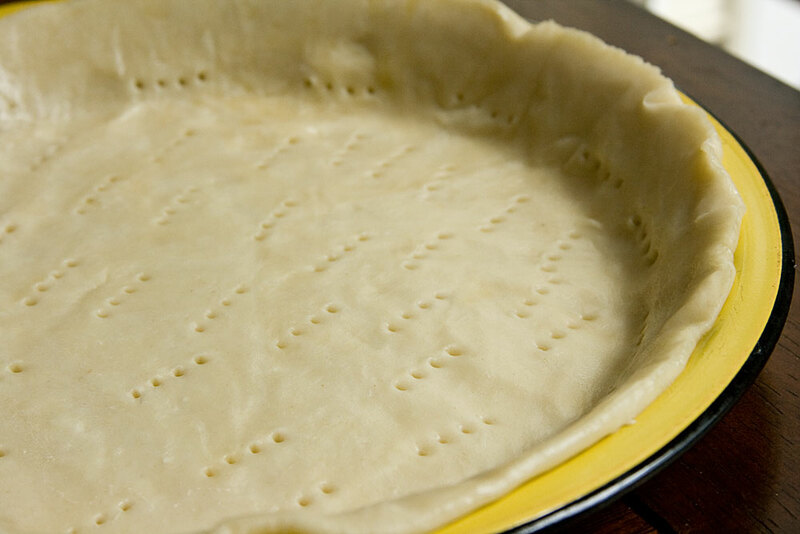 Now, cook up your crust according to the package directions or your recipe if you’re making a homemade crust. 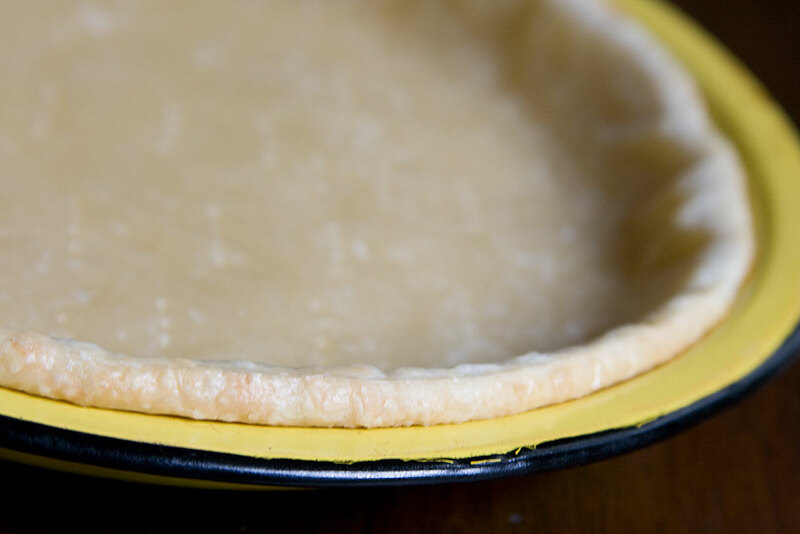 If you don’t have pie weights, you can use a slice of parchment paper and dried beans to weigh down your crust. Once your crust is done, pull it out and set it aside to cool while we get to work on the filling. Whip it up good until stiff peaks form. Uh, yea. I could eat it just like that. Just look at those delicious flecks of vanilla. 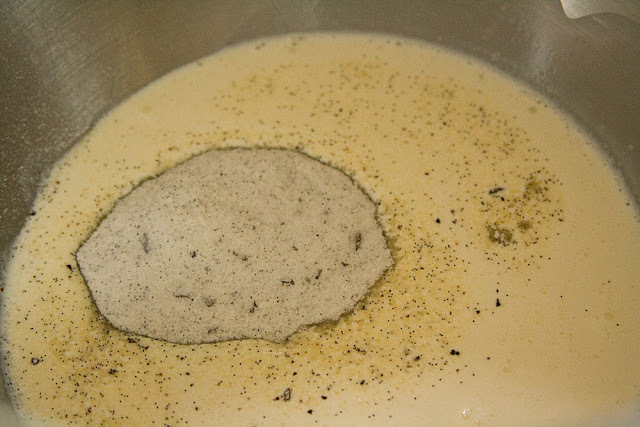 Take your cream out of your mixing bowl and set it aside. Now grab your block of cream cheese, throw it in your mixer and let it whip up for a minute or two. Scrape down the sides once or twice if needed. 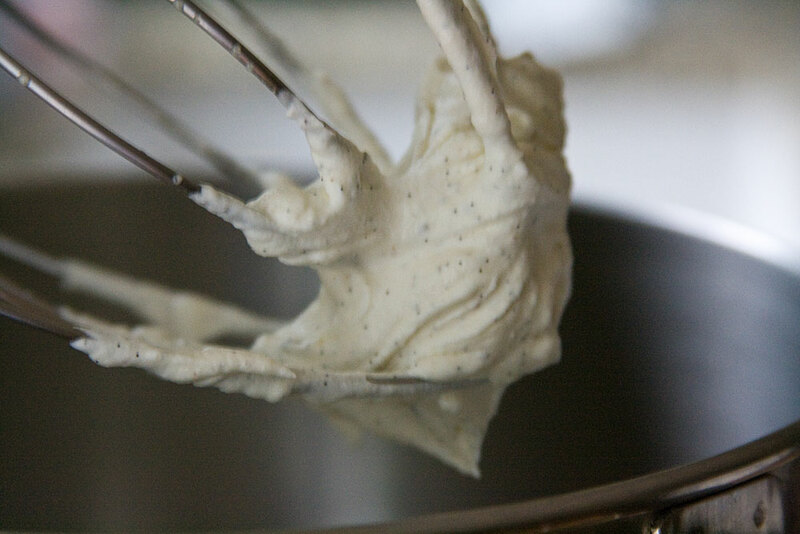 Once you’ve whipped it good, add your whipped cream back in and combine it well with the cream cheese. 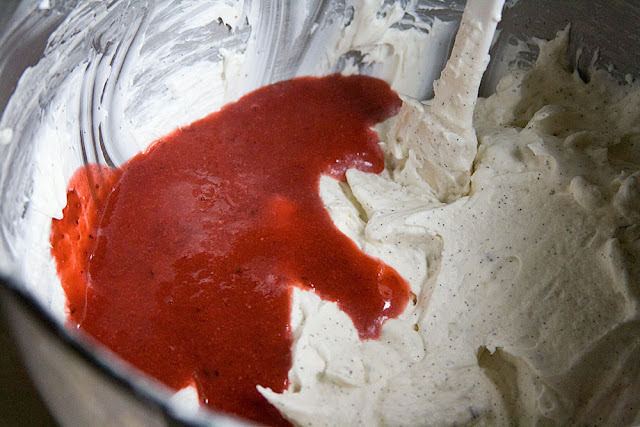 Finally add in your strawberry puree and fold it in until combined. Time to work with our rhubarb. 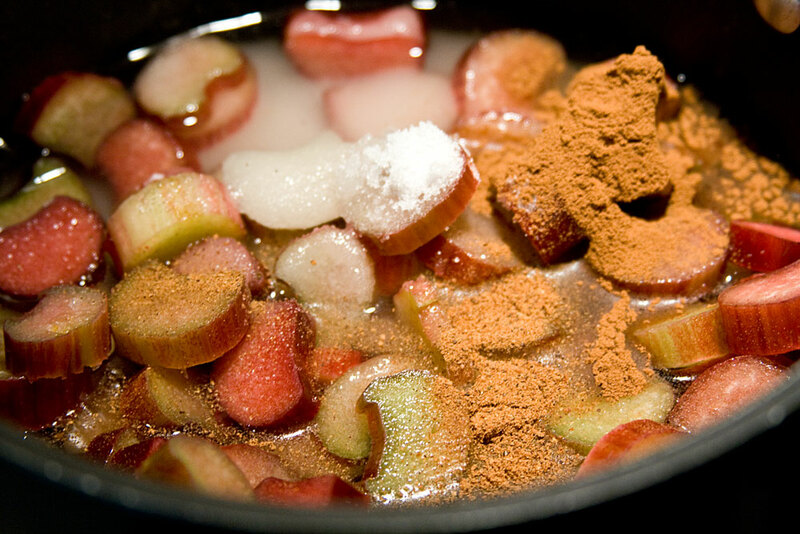 In a sauce pan, boil up your rhubarb, water, the other 1/2 cup of sugar, the cinnamon and the nutmeg. Let it boil for about 2 to 3 minutes. Now grab up a bowl and a strainer and strain the rhubarb juice into a bowl, leaving the rhubarb in the strainer to cool. Return the juice to the sauce pan and let it cook down for another 3 to 4 minutes. Grab your corn starch and mix it together with 1 Tbsp of cold water. 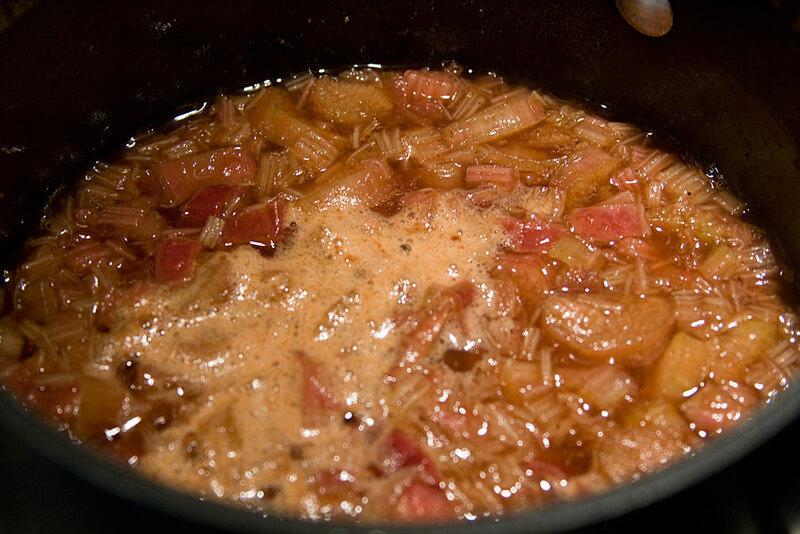 Add it to the boiling rhubarb juice and stir it in until the sauce starts to thicken. Remove it from the heat and let it cool completely. 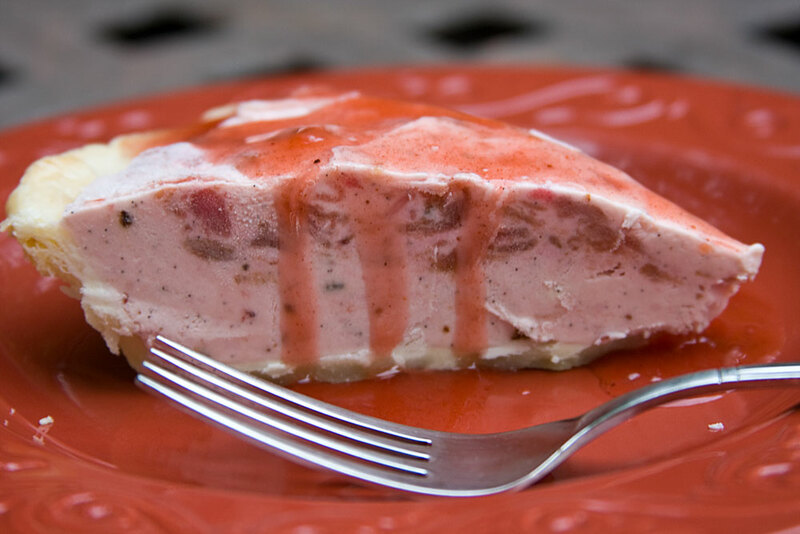 Now mix your cooled rhubarb bits with your strawberry cream and pour the whole badda bing into your cooled pie crust. Smooth it out until it looks real pretty. Start out by cooking up the pie crust. Grab yourself a pie dish and lay your crust in, making sure to push out all the air bubbles. Then grab a fork and stab that dough. Now, cook up your crust according to the package directions or your recipe if you're making a homemade crust. 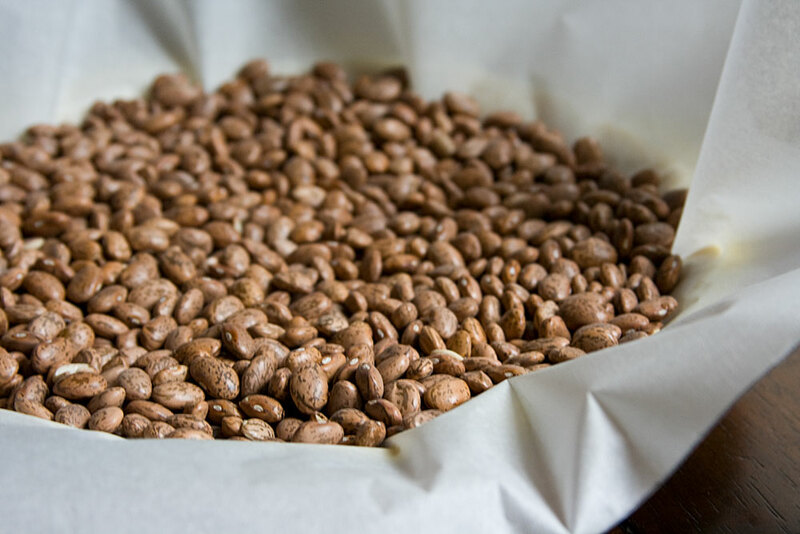 If you don't have pie weights, you can use a slice of parchment paper and dried beans to weigh down your crust. If you're using a vanilla bean, go ahead and grind up 1/2 cup of the sugar and vanilla bean together in your food processor. Then to your mixer add in the sugar/vanilla and the cream. If you're using extract, just add it in with the cream and sugar. Whip it up good until stiff peaks form. Now mix your cooled rhubarb bits with your strawberry cream and pour into your cooled pie crust. Smooth it out until it looks real pretty. Last but not least, throw the pie into the freezer and let it stay there until completely frozen. Refrigerate the rhubarb sauce and when you're ready to serve it up, pull the pie out and let it warm up for 5 to 10 minutes. Slice it up and serve it with the rhubarb sauce poured over the top. Confession: I've never had rhubarb. I have no idea what it taste like. Sad, I know. That pie look so scrumptious!! Your cream pie looks heavenly. I don't know if I could be happier with something on my dessert plate. I can imagine that this would be especially delicious on a hot summer afternoon. Just perfect! Also, LOL @ "holier than the pope." Too funny! As much I love your blog Julie, I may be a little less frequent until I can. . . keep . . . my . . . food. . . down! YUMMMMMMMY! Ok, now why are you, the baking shrine that I worship to, using store bought crust??? But man on man, it looks gooood! I'd love to have this pie for lunch!! Um, yeah. My kitchen disaster don't come out that tasty. I've never tasted rhubarb. I need to jump on that bandwagon. First time coming to your site and THIS is what I land on! YUM!!! It looks sooooo delicious and I love rhubarb. Bookmarking and off to read more! My goodness, rhubarb seems to be on everyone’s mind today! Your improvisation abilities are true Top Chef style! Props to you! I am flirting with the idea of making a rhubarb cake this weekend. We’ll see — I’ll let you know how it goes! Now, I’ve had strawberry rhubarb pie before, but never with the cream. I’m gonna have to try this! I’M WITH YOU!!! I love this post. The fiascoes ALSO happen when guests (or non-family eaters) are involved! I recently took dinner to a sick friend and you wouldn’t BELIEVE the time I had cooking one of my go-to meals! Sheesh! The pie looks perfectly dreamy! A good save! It looks pretty good to me. A lovely color too! Wow – that looks like the perfect summer pie! Rhubarb is everywhere these days! I love those pie crusts. I have never had rhubarb pie..This is another one of your creations that is on my list to try! I introduced my family to rhubarb strawberry pie about ten years ago. Now we can’t live through the summer without them. Until now, when no one has any rhubarb! As soon as my baby plant gets going I’m going to chop him up and try this. Wow that looks good. I just tried my very first strawberry rhubarb pie on Monday…I think the sweet vanilla cream would have just sent it over the edge! I need to find me some rhubarb now and try my hand at it! Thanks for posting this! YUMMMMYYYY!! Gorgeous pie! I love creamy pies! Looks awesome!!! My mother has some rhubarb – I think I’ll have to raid her garden! Lovely rhubarb pie. Love all the wonderful vanilla bean seeds. “holier than Pope John Paul II” <– Awesome!